I realise it has been a little while again, mainly because I have reached a core of good regular recipes I use, but also because I simply have less time to blog when I do do something new. But I still add pics to my various social networking sites, and when I get lovely feedback, it impels me to update this blog. I had a really good time making supper yesterday, having been through a bit of a slump of lack of inspiration and tiredness, and with Godpapa's suggestion of serving the meal on thalis, the meal was just perfect and all three kids ate with much pleasure. It was a very simple meal, really, and only took under an hour to prepare, but it was a really good compilation. 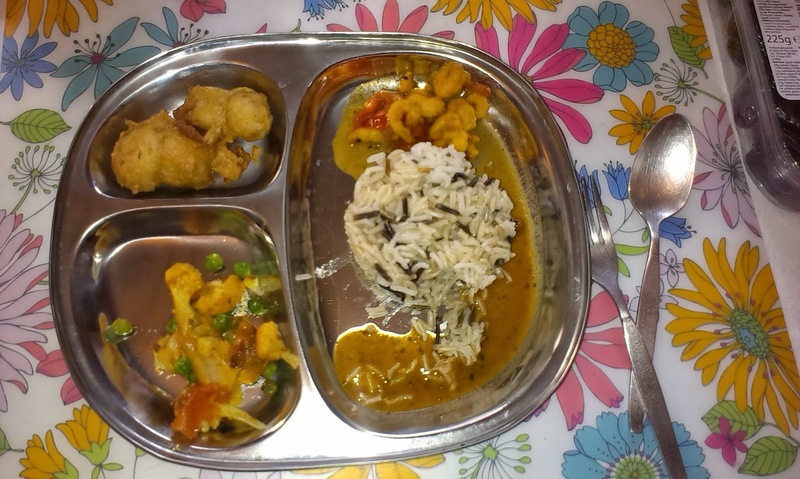 It was the pickled prawn curry which I have blogged before here, along with a very simple cauliflower and pea curry, a mix of Basmati, brown and wild rices, and some quick and easy but crunchy and tasty hake fish pakoras. 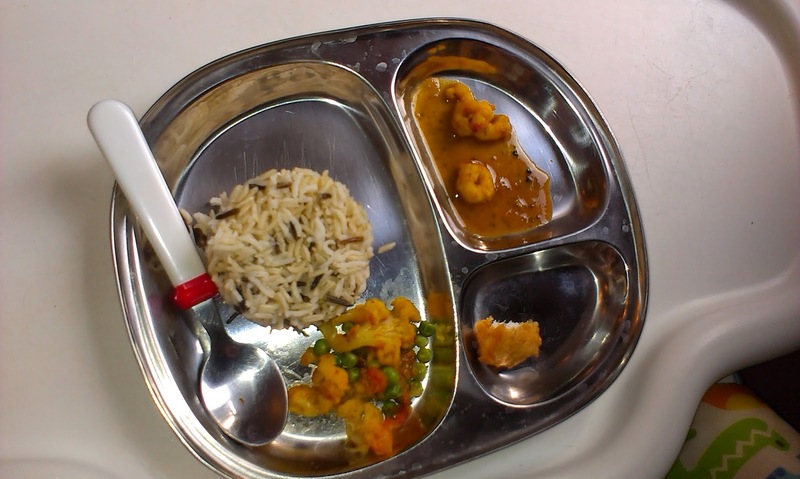 The smaller kids have little thalis which are less intimidating. 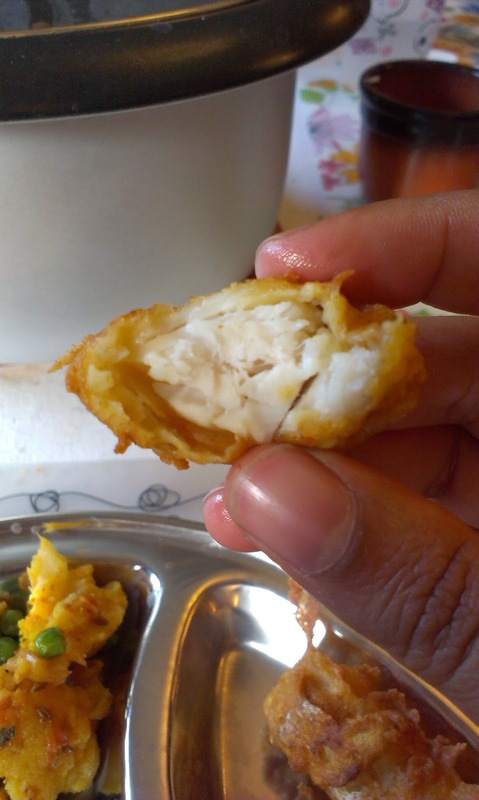 Inside a fish pakora. Batter should be crispy and the fish should be fully cooked but still moist inside. The cauliflower was very easy and I put that on to cook first. I then chopped in a few wrinkling tomatoes and a splash of water, and a little of the tinned tomatoes I was using in the prawns. (I also added some chopped wrinkly cherry tomatoes to the prawns.) About half a teaspoon of salt sprinkled over, then lid on and left to simmer for a few minutes. At the very end I poured in a cupful of frozen peas, and switched it off. The residual heat heats the peas and you want them fresh and vibrant green, not grey green and shrivelled. Meanwhile I made the pakora batter in a bowl and Godpapa helped me by kindly cubing the hake fillet up. About a cup of gram flour, also known as chickpea flour or besan, a tablespoon of sesame seeds, a teaspoon of salt, half a teaspoon of ground cumin, and half a teaspoon of ground coriander. Mix evenly, then slowly add about a third of a cup of cold water. I also remembered I had an open bottle of cheap value basics savers type fizzy water, so added a little splash of that as an afterthought a la Ready Steady Cook. The batter should be thick not runny, I suppose slightly thicker than pancake batter. I then put the fish pieces into the batter, and gently deep fried them in my karahi. If you have a deep fat fryer, this would be much quicker. I had to do it in several batches. I don't fry often, especially not deep fry, I'm not going to justify it, or even explain in detail how to do it, as you kind find that info anywhere online if you have never done it before. Though I will say, if it helps, make sure the oil is hot enough by dripping a drop of batter into the pan. If it sizzles and pops straight to the surface, the oil is just right. Don't do too many at a time, and drain on kitchen paper. The rice cooked itself in the rice cooker, I used a Waitrose brown and wild rice mix, and cut it with basmati which I buy in big bags when it is on offer around Eid and Diwali. 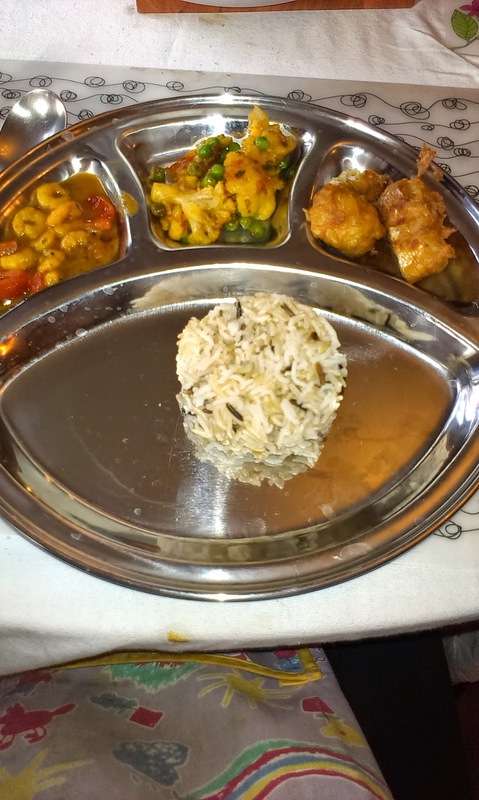 To make things look nice, I spooned the rice into little ramekins and turned it onto the main thali spaces, which amused the kids as that is how Masala Zone serves their thalis. Even Big'Un who normally won't eat prawns ate 3 helpings of the prawn curry, and Littl'Un who has only recently started eating fish again had 2 pakoras. Tiny also ate all he was given and had more, though the rice was on the chewy side for him it seems. Brown rice can be a bit too filling for little tummies, which can mean they don't get enough protein or veg, so I cut back their rice servings accordingly and it went better. The pakora batter is useful for all sorts of things, incidentally! Veggies, small pieces of chicken, onions (of course!) and some people make "bread pakora" as a snack, where squares of bread are sandwiched with a thin layer of ketchup, dipped in the batter and deep fried. It can also me made into a sort of pancake which is more reminiscent of an omelette, useful for vegans and anyone allergic to eggs, especially as it is very protein rich. Have fun, and remember to present food beautifully when you can!